Rose spray pink (3 pt. ), Eustoma white(2 pt. ), Сhrysanthemum pink(2 pt. ), Greens(2 pt. ), Oasis(1 pt. ), Tape(3 pt. ), Ornamental flowerpot(1 pt.). 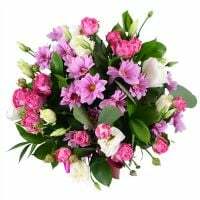 Birthday, Classic bouquets, Colleague, Daughter, For grandmother, For her, For mother, For young lady, Girlfriend, Gratitude, I Miss You, Mother-in-law, Recover, Sister, Sorry, With love. 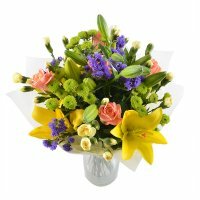 Bouquet "Pink Morning" like a fresh summer dawn - a colorful, tender and hopeful. 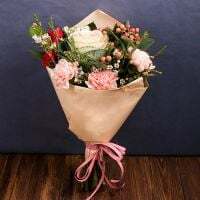 Modest and elegant and at the same time stylish and bright, it is the perfect sign of attention to his girlfriend, or a wonderful gift to a colleague in a professional holiday. 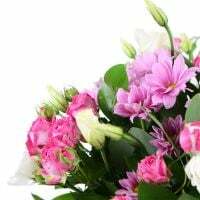 Appeasement, joy, optimism, playfulness - these are the emotions that fill this lovely pink bouquet. Chrysanthemums, roses and eustomy refined triptych delicate tints and shades, and rich greenery adds affirming bright nuance. 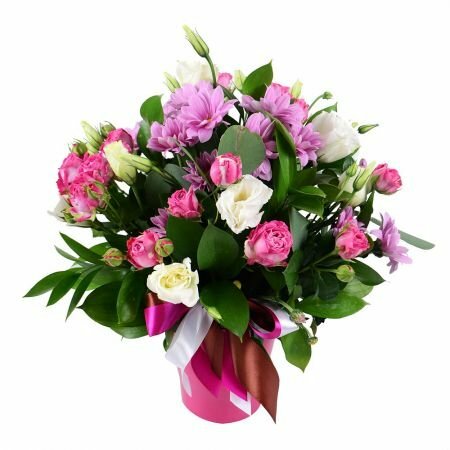 Do not get too scrupulous to seek a way to give "Pink Morning" - this bouquet is not only suitable for any occasion, but also is a great spontaneous gift dear people. Note The appearance of the bouquet may differ slightly from that shown in the photo. Manager response: Hello, Donald. Thank you for your order and feedback. It is Settings in your new computer. Please go to Settings and delete the address of our website from settings sections " not saved". Manager response: Thank you very much for your feedback! We are very pleased to bring happinedd to people you love! Tatyana sent me a set of photos of the delivery. She was delighted with the bouquet and the cake. Another outstanding job by UFL! Manager response: Jean-Paul, thank You for Your feedback!We are glad to bring happiness to people you love! 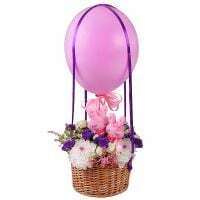 I sent 7 bouquets to all of the ladies who work in a wedding dress shop in Kiev. I was their hero that day. The ladies sent me at least 20 photos of themselves and the roses and eating the Kiev cake that I sent with the flowers. Thanks again UFL for a fabulous job! This was a milestone of sorts. It was my 20th order with UFL. The lady was taken completely by surprise. She loved the orchids and truffle cake that I sent to her. She sent me a photo of herself and the delivery driver )) Tatyana has a great sense of humour. Thanks again UFL for a superb job! Manager response: Jean-Pau, thank You for Your feedback! We glad to deliver Your orders! Very disappointing. 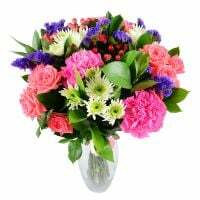 I messaged UFL in the morning they flowers were to be delivered and they assured me that they would be delivered by 6pm that day. At 5pm I messaged them again because they still had not been delivered, and again I was assured that they would be delivered. It is now 10:30pm nothing, so I called and canceled. Its not much fun when your gf is waiting all day on valentines day for flowers that never showed up. Seeing everyone around you get flowers and their heart sinks each hour that they didn't come. When you have a gf in another country, you count on services like this to deliver on their guarantees, but no matter much you check and double check they failed to deliver. 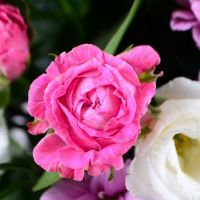 I will be looking for other flower companies in the future.